 REV'IT! celebrates milestone with bike build that ignites hailstorm of opinions. 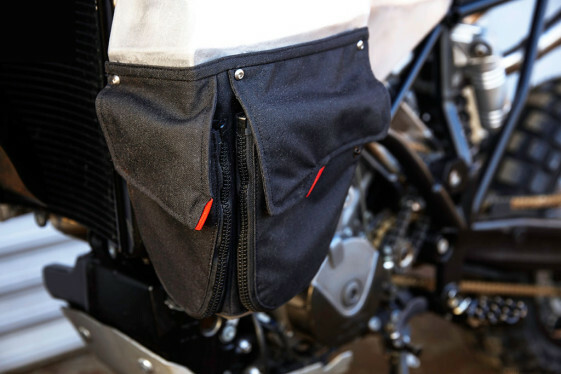 Dutch motorcycle accessory company REV’IT! 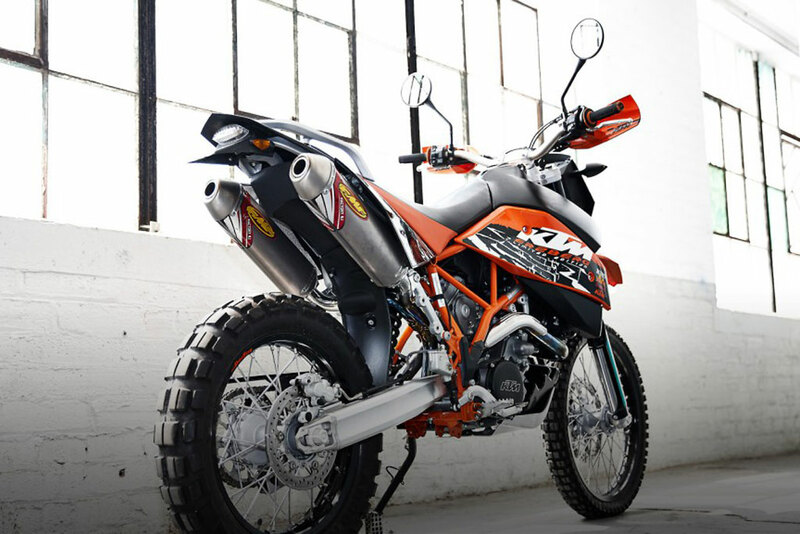 does not do things in small measures as its radical rebuild of a KTM 950 Super Enduro attests. 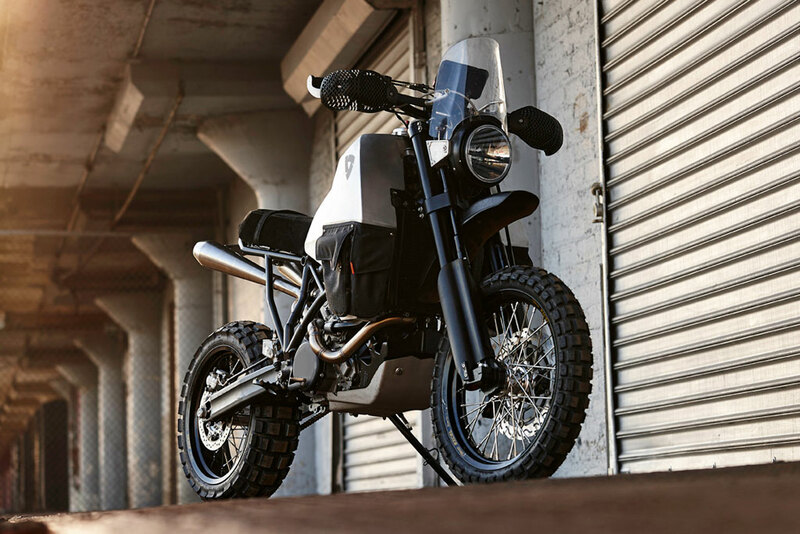 Vowing to build a motorcycle that can go anywhere, the REV’IT #95 – homage to the company’s 20th anniversary – heralds a new direction for the company. The REV’IT! “Project Double Dare” bike build made a bold statement when it was introduced, not least because of its unique styling, all-wheel drive system, a monster 12-gallon tank, and a distinctive wheel set that separately and together, represents an extreme departure from the host KTM 950 Super Enduro. Both advocates and critics alike have had a lot to say about the bike since the unveiling and debates continue to smolder. REV’IT! commissioned an extreme bike build that was sure to turn heads and raise a few eyebrows for the company’s 20th anniversary. A Christini AWD system powers the front wheel when the rear wheel starts to slip. While the REV’IT! #95’s true off-road potential will only be scrutinized once it is properly put through its paces, for now the bike is being judged on its pure resolve and visual appeal. A clue to the project’s aesthetic motivation is the play on functional elements – no rear fender, no luggage rack, vintage style round headlight, gleamingly flared twin pipes, even the re-invention of the company’s protective elbow pads as hand guards. Purists may well sneer at an iPhone 6 doing duty as the instrument cluster, but with a built-in GPS, the smartphone can serve whatever function the rider wants from it. 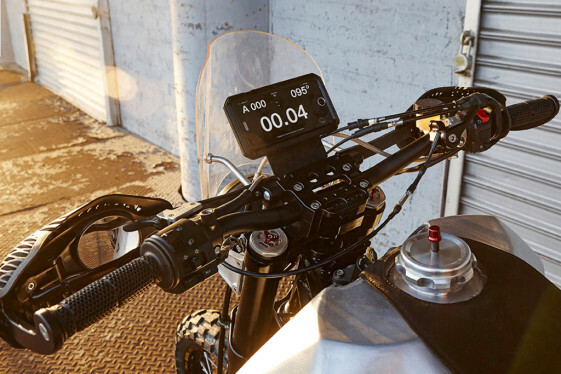 The standard dash was replaced with an iPhone 6 and uses a variety of apps to run the speedo and GPS. Not all features are considered as practical. Critics are quick to point out that the 19″/17″ front-rear wheel combo compromises the more off-road friendly original 21″/18″ set-up, and that notwithstanding the machine’s go-anywhere aspirations. Other detractors question the bike’s ability to soak up true dirt punishment. They wonder about the additional weight and bulk of the oversized fuel tank on the trail, where to carry luggage, and how does the rider avoid crud flung from the rear tire with no fender? 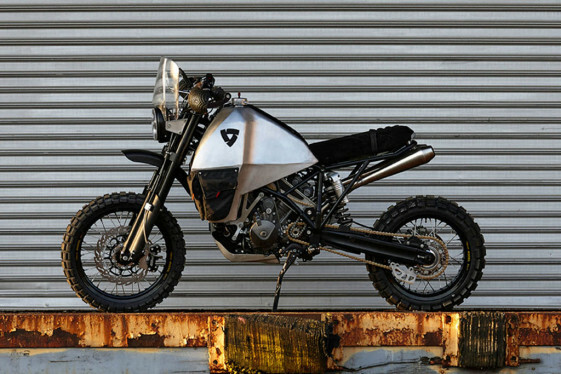 Then there are the dirt demons who ask why tinker with a KTM 950 Super Enduro that is already as close to adventure perfection as one can get? REV’IT! started with this pristine KTM 950 Super Enduro Erzberg Edition with 500 miles on the odometer. Whatever one’s view on this radical bike build, the exquisite attention to detail of the REV’IT! team is beyond doubt. Astounding craftsmanship and the thought processes behind fabricating the frame, modelling the aluminium tank, reshaping the seat, and uncluttering the handle bars, speak of a deep-seated passion for perfection. Despite a healthy dollop of innovative technologies like the light-weight lithium battery, full LED lighting and iPhone 6 dash, the bike exudes an undeniably retro feel. Vintage styling cues like the large round headlight, flared pipes, flat scrambler seat and minimalist windscreen blend seamlessly with the modern pieces. The REV’IT! #95 incorporates retro styling cues that invoke a sense of nostalgia. Some have criticized the project bike for having no place to attach luggage without melting it on the exhaust or the lack of rear fender. Whatever your opinion, one must remember that Project Double Dare is a metaphor for the company’s marketing endeavors. It represents the company’s vision to create an iconic custom motorcycle that epitomizes the ambitions and ideals of the REV’IT! brand. Whether the project succeeds in marrying form with function is a matter of opinion. What cannot be denied is that Project Double Dare is achieving exactly what a show bike is supposed to do – push the boundaries and ignite a talk storm. REV’IT! 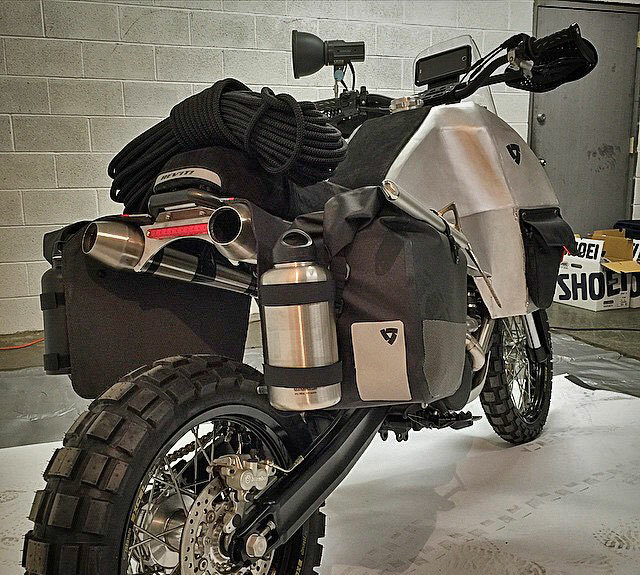 incorporated materials from their 2015 riding gear collection in the seat, handguards and these tank bags. 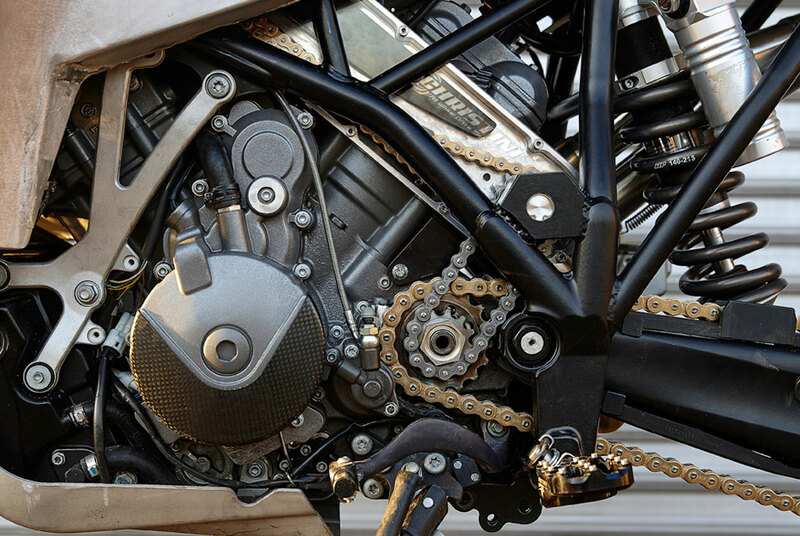 Interested in learning more about a Christini system on a big bike? Take a look at the big beast adapted by CJ Designs. It doesn’t have the bling or the marketing that REV’IT has, but it does have over 50,000 miles of testing on the system.